my latest lino print is finished now, entitled 'Patience in Caffe Nero'. 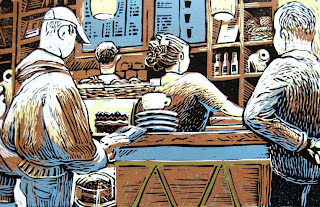 It's approximately 45x17cm, and was made with 2 seperate lino blocks. The first block is the colour stages, starting with light yellow, then medium brown, some selective areas of darker 'bronze' yellow, and finally a light grey/prussian blue. The second block is for the black lines and dark areas. This was quite a detailed print to make, involving some things I had to practice, such as my cutting skills and how to make interesting textures. I also had to use a better registration method. Sticky tape to fix the paper to the mountboard wasn't working very well, with some paper slipping and also the tape came away from the paper and took the top layer off. Yuck. 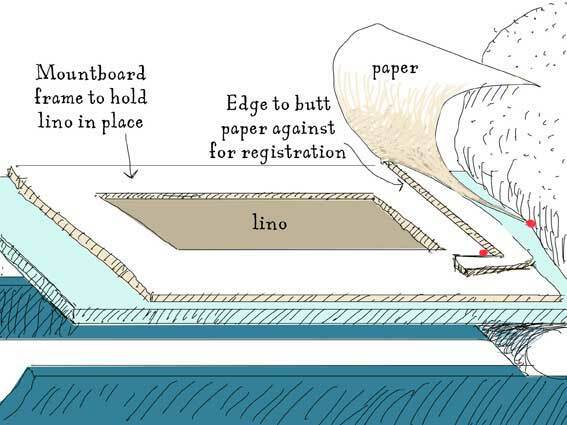 Instead I used a length of mountboard with an L shape attached to the 2ply frame (see wobbly diagram below). This has given me some inspiration to do a print with more areas left uncut, as I quite like making the areas of colour a little speckled and seeing that texture mixed with the cut lines. Also the areas of blue against brown look kind of zigzaggy and are quite exciting, so has given me ideas of using bright colours against eachother. 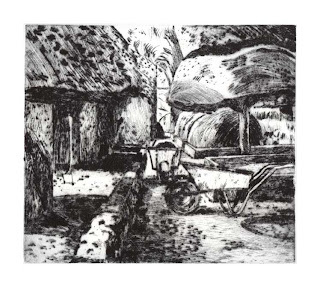 Made in the last couple of days, this is a drypoint print of wheelbarrows under the trees at Levens Hall. It is 22.4 x 20cm and currently an edition of 4. The first print is on white paper and is quite a light image compared to the second. It has a graphic look to the marks, making them the print's point of interest. The latter is on soft white (cream) paper and has a warmer softer quality. In this way it's bringing out the tones and depth of the scene. Surprising things always happen with drypoint. With this particular plate, the image can be given a very light wipe, which leaves a lot of ink on the plate. Interestingly when you have an area with no engraving and you leave what you think is more ink on it still seems to come up pale or even white. Also, I've taken Norman Ackroyd's tip and started to put the ink on with a roller, rather than scraping it on with a bit of card. This way there's less damage to the plate, and you don't end up in ink-hell having to scrape off loads of wasted ink. Another tip is paper soaking. I have finally found a way to get the perfect condition of printing paper. Using Somerset Satin or Velvet 250gsm paper I soak it for 1hour, with the sheets on top of each other, then after letting all the water drip off place them as one stack between plastic (I use a portfolio plastic sleeve) underneath a heavy drawing board for 48 hours. It seems like a really long time, but it lets the water saturate every particle of paper evenly. Afterwards you can blot your paper well, and the paper should have the quality of flowing heavy silk. Just before printing you can flatten the paper a little bit more by running it through the press under a sheet or two of tissue paper. This will help the paper get into the lines of the plate more. And when printing you can put a sheet of tissue on top between the blankets and paper, this will help to get that little bit more detail but squashing the paper a tiny bit more. I wish I had learned this earlier... Sometimes the air has turned blue after seeing a print on paper which hasn't been soaked long enough.